My family stayed here for a week. Manager ellie has no customer service. If you are going to dnr someone at least have the courtesy to say something and not leave it up to the staff to do it. Lisa and Kati at the front desk were awesome. Anyone who stays here make sure u don't leave children under the age of 21 in the pool area even tho their pool sign says under the age of 12 alone. I went to meet a friend here and it doesn't seem all that great. It's near the strip so that's good but the traffic in this area is a bit much. They have nightly and weekly stays so that's good. But I don’t recommended coming here. There are other places in Las Vegas that feel safer and closer to the strip area. I came here to spend the weekend with my boyfriend, we got a one bedroom with a full kitchen. And for the price we paid I honestly don't think the rooms are bad at all! I really loved how it was a pet friendly hotel and they had doggy poop cleaning stations! I really loved that they had that accommodation. the staff was really sweet and patient. The only bad thing I could say about this place is that it could just need for work on the grounds themselves. Like hosing off the side walks and a fresh coat of paint on the building, but for a quick hotel booking I'm pretty happy with my stay! I stayed here over 2 years ago and even though it was not a 5 star property, I was pleasantly surprised. I recently stayed here again and WOW!!!!! I am absolutely disgusted!!!! Not clean and desperately needs to be renovated. I work in the hospitality field and I know when beds need to be changed, when things need to be updated. This place takes complete advantage of people's situation, not caring about the property and making families feel safe and comfortable. I will NEVER stay here again nor will I EVER refer people here. I let the manager, Randy, know of my concerns and the way my issues were handle ....I would rate a 1 as well. It is very apparent the employees here are only here for a paycheck. If at all possible, please do not stay here. I feel sorry for Tahiti Village and Segal Suites Select because this place HAS to be bringing down their value. This place is disgusting. I was staying at the Tathiti Village next door but needed to stay somewhere for a night before the Tathiti. I booked this place, not expecting it to be too fantastic.... but it turned out worse than I thought. 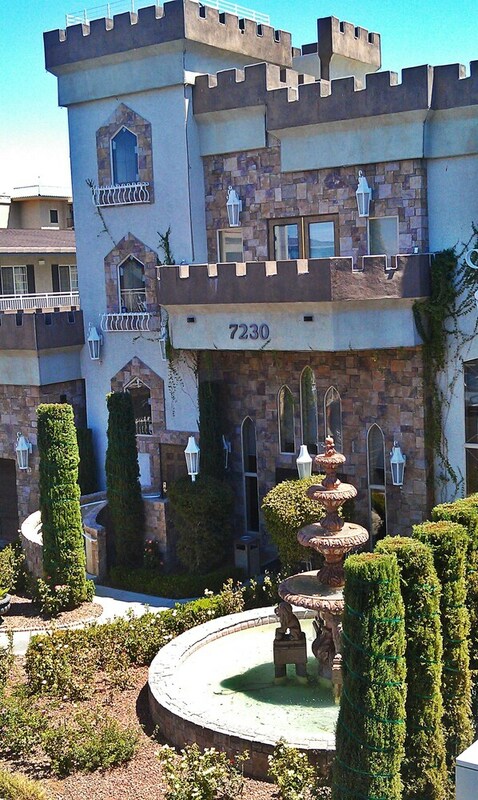 Looks kinda cute from the road.. castle like.. even the lobby isnt THAT bad. Its like a motel where each room has outside doors. Theres two floors. We were in the top back, two bedroom. We were two ladies and we were actually scared here. There were alot of creepy men standing in there doorways (which we had to pass by to get to our door) and they made us very nervous. They always had something to say.. also there was really really bad marijuana smells constantly from the rooms. We also saw prostitutes go into the rooms during the evening and night. The "suite" was disgusting. Very old and scuzzy. I didnt even want to sit on the couch. I slept in my clothes on top of the bedspread with one eye open. I didnt even want to put my luggage on the floor.. i stayed because i just tried to bear it for the one night. Pool looked gross too. I will never ever ever go back. First of all, this not your typical motel. It's primarily an extended stay operation for workers/contractors in town on extended gigs. The rates on their "week special" are $199 plus 12% Clark Co. room tax. It works out to less than $35/night.This is not a place to stay for 1-3 nights as the rate on that basis is closer to $100/night. Be advised, the special rate does not include ANY linens, towels or maid service. It's rooms consist of "mini-suites with a separate bedroom segregated from the Living room and kitchenette area. Unfortunately bedroom cannot be completely closed off from living room area due to the location of the large and old CRT TV. They also have 1 and 2 bedroom apartments. The bad: King-size bed was hard as a rock-like sleeping on a sheet of plywood. Internet access is via ethernet hardwire (NO WIFI) and notoriously unreliable (and not very secure...). Office was good about resetting the connection, but I found it to be a PITA. The area is not the safest. As another reviewer commented: it is true that Metro shot and killed a deranged woman on June 25, 2014. You can google it. Which brings up the other points of unsavory characters, drug dealing/use around the property along with a few "working girls" occasionally on the property. The walls are thin and there is frequent partying into the wee hours. that's Vegas. Security guard only there 2 or 3 nights a week. The Good: Large laundry area with maybe 24 newer washer an dryers. Decent parking. Nice looking pool- which I never used in my 11 weeks there. Office staff nice. (I would have given higher marks for service but for the notable lack of nighttime security.) TV had HBO with decent picture. What can I say? You get what you pay for. This place is not for you if you have delicate sensibilities. But overall, for what I paid, it was decent for the price. our room is very clean and pple are here are nice. the pool is clean, stores are right next store, easy to get to places from here. nice area, i would tell my friends and fmily to stay here. Not far from the airport. The rooms are just ok. They're over charging for their services and for the mediocre room! There is no privacy in any of the rooms if you're staying with other people. The furniture is dated, the carpet and couch is stained, ripped and dirty, there is no dishwasher or garbage disposal, and the electric oven is very small. Their 'internet' service?? Well don't expect it to work when you want it to. The lady at the front desk said that they need a 'part' in order to fix it. The part has been on order for a long while! Sounds like a bunch of B.S. to me! The people who live there look like they're on drugs. There are kids running around all over the place yelling and screaming at each other, there are prostitutes walking around at all hours of the day and night, and while I stayed there, there was a murder that made the local news. I suggest that you book yourself in a nicer place if you're looking for a memorable vacation in fabulous Sin City! We got this hotel because we had my mother-in-law with us to take care of our kids while my husband and I took a course in Vegas. We needed a place with a few rooms and were wanting the option of cooking our own food. I expected this to be similar to an extended stay and I guess that it was in a very minimalist way. There were many long term occupants, some of the more seedy kind. Many looked like they had used too much alcohol and drugs. One of our neighbors had a domestic dispute which brought in some of the other residents. While there is a full sized fridge/freezer and small oven, there are NO pots, pans, plates, or anything else in the kitchen. Makes food prep challenging. The rest of the room was just okay. Older TV with sometimes poor reception. The table fell off the wall, but was promptly fixed. The beds and bedding was older but okay. I did find a cockroach in one of my bags in the morning but the room seems clean from the look of it. The foyer to the hotel and the pool area was nice (and kind of deceiving!). My mother-in-law said the pool was nice but they don't provide towels. It is a relatively inexpensive room in vegas but you get what you pay for. I don't think we would stay there again but it wasn't horrible. My boyfriend and I stayed here New Year's Eve. Even on a busy day the prices were reasonable. I believe that the motel is generally used as a long stay motel. Has full sized refridgerator, stove, microwave, and sink. Small breakfast nook and a living area plus bathroom and bed room. Far enough from the strip you are away from the crowds but close enough that you can be at a strip hotel (bellagio) in under 5 minutes and that's with New Year's traffic. The motel did have security gates for each floor and stairwell access but, at least on NYE, they were propped open. However I never felt unsafe or concerned. Overall, we believe we got our money's worth for a clean, comfortable, and convenient motel. Town Square Las Vegas is within a mile (2 km) of Manor Suites, and other popular sites like Welcome to Fabulous Las Vegas Sign are within a couple of miles (3 km). This 260-room hotel welcomes guests with conveniences like an outdoor pool, free self parking, and a spa tub. A TV comes with cable channels, and guests can stay connected with WiFi and wired Internet. Other standard amenities include a kitchenette, a refrigerator, and a microwave. Limited housekeeping is available. Guests of Manor Suites enjoy features like an outdoor pool, a spa tub, and laundry facilities. Free parking is available if you drive.